The gold standard for the diagnosis of Coronary Artery Disease is by invasive Coronary Angiography. Upon detection of significant blockages in the coronary arteries, you may be advised to undergo Percutaneous Coronary Intervention (also known as “coronary angioplasty” or “coronary stenting”). This is a commonly performed low-risk invasive procedure that involves the introduction of a catheter (narrow tube) through an artery at your wrist or groin. Using X-ray and the simultaneous injection of contrast through the catheter, your coronary arteries can be visualised for the diagnosis of blockages that may restrict blood flow to your heart. If a significant narrowing of one or more of your coronary arteries is detected, you may be advised to undergo a PCI to relieve the narrowed portion of the blood vessel. Angioplasty involves the “opening” of the narrowed segment of the artery using a balloon. Most of the time, a stent is implanted to this segment of the artery. 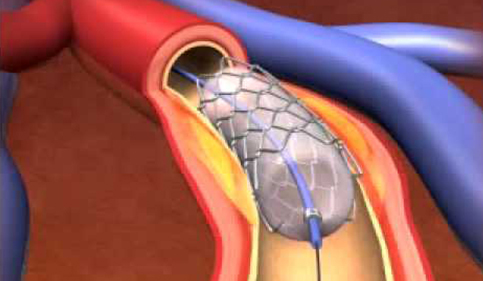 The stent acts as a scaffolding to keep the artery open and unobstructed. If a stent is implanted, you will be recommended to take blood-thinning medications like Aspirin and Clopidogrel for a period of time. Narrowing involves the origin of the main arteries or if the narrowing is involving almost the entire length of the artery. The intervention can be done via the groin or wrist with a high success rate although specialised equipment, e.g. rotablator drill and stiff wires, and greater technical skill may be required. Sometimes, the narrowing may not be amenable to angioplasty, or may be blocked at critical positions that significantly increase the risk of angioplasty. You may then be recommended to undergo a Coronary Artery Bypass Graft Surgery by one of our trusted cardiac surgeon colleagues.